Pope Francis has often urged the faithful to resist the temptation of today’s ‘throwaway culture’ and denounced the tyranny of capitalism. But that hasn’t stopped traders stocking up top notch papal paraphernalia – or Pope-phernalia – ahead of his Irish tour. 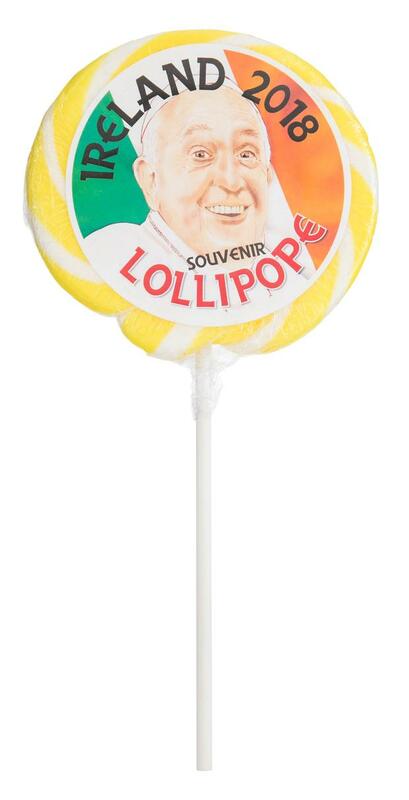 With less than 25 days until he arrives, sales of Dealz’s Lollipope – a lemon flavoured lolly with a picture of Francis’s face plastered across it – are flying out the door. They have already shifted 30pc of the stock. Veritas book store is promoting timely religious reads including a ‘What Would Pope Francis Do?’ self help book, and a picture book for Catholic children titled ‘Fáilte Pope Francis’. The closer we get to Pope Francis’s visit the more intense papal production will become. When he attended the World Meeting of Families in Philadelphia back in 2015, there was a plethora of novelty memorabilia. Pope Francis scented cologne, The Pope is Dope T-shirts, and Pope-On-A-Rope bars of soap to ‘wash away your sins’. The Philadelphia Brewing Company even released a limited edition ale called the ‘Holy Wooder’. However, here some people are hoping we show more restraint than our American brethren, stick to Francis’ teaching, and invest in more meaningful merchandise. In Dublin, businessman and Ireland’s leading flag producer Ken Cairns of Prospect Designs is busy. Cairns and his 20-strong workforce are producing thousands of high-quality Vatican City flags, bespoke hand wavers and personalised parish bunting to mark the historic visit. “There will be a lot of things on sale but I think a high quality flag or commemorative printed picture will stand the test of time,” he said. Prospect Design produce flags for government buildings and their work has travelled around the world and even into outer space. Cairns produced flags for Pope John Paul II’s visit in 1979, working an average of 80 hours a week in the run-up to the last papal tour. While things have not reached that level of hysteria just yet, it has been a busier than usual summer, between the papal visit and the World Cup. Many people still have mementos from the last visit. Others didn’t have such sentimental attachment. Two months after Pope John Paul II’s said farewell, an auction hawking everything from the wooden fencing posts to the red carpet used in the Phoenix Park took place. Amongst the items that went under the hammer were 300 sections of papal carpet, 47 communion tables, 2,500 wooden benches and 500 umbrellas. The auction was held in the vesting marquee used in the Phoenix Park, and even that was up for sale. Successful bidders not only walked away with historic ephemera, but ultimate bragging rights – and the promise of plenary indulgence. Not a bad trade off for some novelty merchandise.